The Bob Baker Marionette Theatre in Echo Park is, without a doubt, a Los Angeles staple. The theatre hosts shows and events featuring the most talented puppeteers and the most uniquely decorated handmade marionettes. Though the theatre caters primarily to young audiences, adults have consistently raved about the performances, and some even consider it a “psychedelic” experience, thanks largely in part to the off-beat soundtracks, wacky themes, and dizzying light show, and sounds. Bob Baker (1924-2014) started experimenting with puppeteering when he was just eight years old, and went on to become one of the world’s most renowned puppeteers. Over the course of his career, he served as the animation advisor for several studios, including Disney, and his puppetry work has been featured in several shows and films, including Bewitched, Star Trek, Land of the Giants, and Close Encounters of the Third Kind. Bob Baker’s marionettes have also performed live around the world––even on submarines and Navy ships. In a long-term plan to preserve the Bob Baker Marionette Theatre for at least another 50 years, the theatre transitioned into a non-profit organization. The company is currently rebuilding and expanding its theatre to accommodate this new mission. The 2018 construction will rejuvenate the current space, allowing the theatre to remain where it’s always been. The new space will be based on Bob Baker’s original design sketches for the space, allowing the company to live up to its reputation and founder by fulfilling some of his lifelong dreams for the theatre. In addition to the renovations, they’ll also be adding a workshop, museum, and educational space to engage with the community. These new facilities will also help foster partnerships with other cultural and educational groups. While the new space is under construction, the organization will be a traveling theatre and continue to host shows and events around Los Angeles. Construction is expected to end late 2018, or early 2019. For a one-of-kind birthday party, the Bob Baker Marionette Theatre is the way to go. The Birthday Party package includes a personalized sheet cake from Hansen’s bakery, drinks, a fully decorated birthday area, balloon festival, and meet-and-greet with the marionettes at the end of the show. The party packages are customizable, and families can add additional party favors for a fee. Though there’s no kitchen access, guests are welcome to purchase and serve their own food. You can’t have a conversation about outdoor activities in Echo Park without talking about Echo Park Lake. This historic park underwent a massive makeover and has remained a go-to ever since. The lotus flower blooms make way for the Lotus Festival (mentioned later) and downtown views make for the perfect backdrop to a sunny afternoon. Though you’ll have to keep an eye out for events, there’s plenty to do here on a day-to-day basis. Start your day by heading over to the revived boathouse for breakfast at Square One. Then have a picnic, go fishing, take a stroll through its pathways, or rent a pedal boat and coast along still waters. If you live in Echo Park but commute downtown for work, why not spend your lunch hours listening to music at Grand Park? The performance lawn will have free music and plenty of food trucks to satiate your hunger. Head over to check out the local talent every other Thursday throughout the year. Echo Park is renowned for its many staircases, some hidden and winding, while others offer phenomenal views of the Los Angeles landscape. Whatever your style, there’s a staircase for you. It makes for the perfect workout and helps build appreciation for the neighborhood. For a challenging workout, the Baxter staircase is your best bet. The 231 steps offer downtown LA views at the top, and you’ll even find a wealth of succulents at the bottom of the steps near Elysian Park. Alternatively, the Delta staircase offers some great views of the northern side of Echo Park and is adorned with natural floral displays growing along the stairwell. Head to the Dodger’s stadium and root for your home team. Tickets start at just $12, and it’s a perfect way to spend a sunny afternoon. Go for an infamous Dodger Dog, or head to one of Echo Park’s highly-rated restaurants nearby. There’s little doubt that beach yoga is worth traveling for. Head over to the beach for SUNSET Beach Yoga with Brad. The class is held by Brad Keimach, a Juilliard-trained conductor who’s also a yoga enthusiast and health lecturer. Classes are held on Wednesdays, Saturdays, and Sundays, and while no registration is required, there is a minimum donation of $15 for each 90-minute session. The Santa Monica Business Group voted the class “Best Yoga Business in Santa Monica” for the past three years. Every year, the City of Los Angeles hosts the The Lotus Festival, an Echo Park Lake event that occurs during the lotus flower summer bloom. Each year, the festival is hosted by a different country. Last year, the host was Bangladesh, while this year, its 38th installment will be hosted by China. Expect traditional dancing, food, and other attractions inspired by the Chinese culture. This year, the event will be held July 14th and 15. There will be dragon boat races, free family-friendly entertainment, a silent auction, and much more. Visit the Lotus site for more information. Starting at just $45, you’ll have access to unlimited beer tastings at the 2018 LA Beer Fest, held at LA Center Studios Studios over the course of two three-hour sessions (one session per ticket). Last year’s event was completely sold out, and this marks its 10th annual event. Expect dozens of domestic and international beers, food trucks, and live music. Proceeds from this event will go towards Noah’s B-ark, Inc, a non-profit organization whose aim is to rescue dogs from shelters and place them in permanent homes. Valentine’s Day is a day of love and laughter, and there’s plenty to go around. 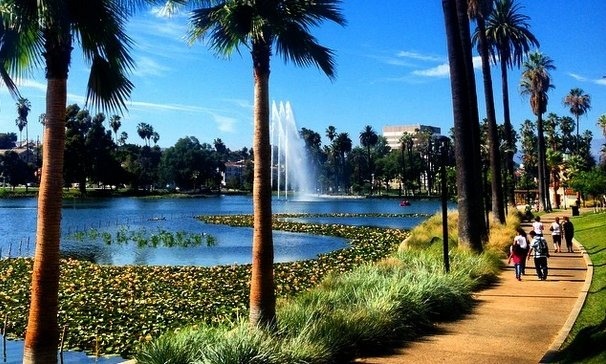 With a romantic lake at your doorstep, Echo Park is the perfect backdrop for a romantic Valentine’s Day date. Every year, there are some amazing, eclectic experiences to be had in Echo Park and the surrounding area. If you’re looking for date ideas for the perfect February 14th, look no further. We’ve summed up the perfect events and dinner spots to help you and your loved one have an ideal Cupid’s date. Right before you head over to your evening dinner plans, consider stopping at Bar Bandini. It’s dark, sultry, relaxed, and makes for the perfect introduction to a nice glass of wine. The grapes are processed organically with little intervention, and made using native yeast. There are some small fare plates and wine friendly appetizers to hold you over until dinner. A highly knowledgeable staff that will help you choose the perfect taste if you’re overwhelmed by the large list of wine choices. .
Alternatively, El Prado is an Echo Park wine bar that’s fairly mellow during the week. This is a no-gimmick spot with plenty of wine and beer offerings and appetizing bar bites (think: pita and hummus). It has a cozy bohemian feel, impressive vinyl collection, and outdoor patio. If beer is more your style, there’s no better place than the Sunset Beer Company. There are 500 varieties of beers here, and several selections of wines. There’s everything from California microbrews to rare Belgian ales. The atmosphere is cozy and comfortable for couples who want a relaxing start to the rest of their evening. Lastly, at restaurant Mohawk Bend (considered a “beer wonderland” by LA Weekly) there’s no shortage of options. California craft beers are paired with American fare at this highly-rated, brick-walled eatery. Almost the entire menu is vegan, but you wouldn’t recognize it from its offerings: expect vegan-friendly pastas, pizzas, and salads. Take your date to a cooking class, where you can both learn something new and feast on your own cuisine. There are plenty of amazing cooking classes in Echo Park and the greater Los Angeles area. For example, the Donable cooking class teaches guests how to make traditional Japanese fare while in a small, intimate setting. At the end of the class, you can purchase any of the Donabe ingredients and products to take home with you and try your hand at home. Over at Eataly’s La Scuola, you can learn to master Italian dishes with renowned Chef Lidia Bastianich, where handmade pastas are the specialty. La Scuola also offers experimental walking tours and paired wine dinners. For dessert, why not try decorating a cake together? Duff’s Cakemix is hosting a Valentine’s Day cake decorating class where couples can learn the art of professional dessert decorating while having fun. You’ll be able to pipe, airbrush, roll, and execute other techniques alongside pastry chefs. There will be snacks and drinks available, as well as raffles to win some of the bakery’s delicious baked goods. The price is just $60 per couple. If you enjoy a unique cultural experience and dancing, why not swing to the beat with your partner at a dance class in a train station? That’s exactly what will be happening this Valentine’s day at Union Station. Afro-Cuban dancer Chris Kizomba will be teaching visitors how to dance in the style of kizomba. Expect this to be a high-energy event, followed by a full-on dance party with live music from Ricardo Lemvo y Makina Loca. There’s nothing like cozying up to a romantic film. This year, there will be a Cinespia screening of Roman Holiday (Audrey Hepburn and Gregory Peck). Tickets for this event are just $33 for General Admission and come with complimentary sparkling wine from Freixenet Cava. If that’s not your style, head over to the El Capitan Theatre to catch an animated viewing of the classic tale, The Lady and the Tramp. This film will be showing between Feb. 9th – 14th. Before each screening, there will be a live accordion performance by Ed Vodika. If you don’t get a chance to see it, keep El Capitan in mind for next year — they usually show Valentine’s themed movies during this time of the year. Lucha Vavoom is great for couples who want to combine fun and adventurous with your classic V-day date night. Here, you’ll find fun masked Mexican wrestling matches with and knee-slapping comedy, and it’s sure to deliver a great time. The entire event will be Valentine’s Day themed, and there will be plenty of V-day gifts and surprises. Each member of your team will have a dedicated room that’s equipped with the latest virtual reality gear. As you maneuver the game, you’ll be able to be to move around the room and collaborate with your other team members virtually. You can’t go wrong with your classic dinner date, and Echo Park has some of the best restaurants in Los Angeles. Among them are Ostrich Farm, Elf Cafe, and Winsome. At Ostrich Farm, the food is made fresh daily and brunch is especially popular. Recommended dishes include the varied and delicious cheese plate, Pork “ossobuco”, and spicy chickpeas. The Elf Cafe serves Mediterranean food and the menu boasts an all-natural wine list. Many good things have been said about its cuisine and interior. LA Eater considers it one of the most underrated restaurants in Los Angeles, while LA Weekly stated, “Every dinner here feels like a special occasion.” Try the Moroccan vegetable tagine, California risotto, and buffalo oyster mushrooms. Lastly, Winsome offers a little bit of everything with classic American food with a twist, served in a laidback, lush California setting. Some of its more popular menu items include the Lamb ribs, bone-in pork chop, and potato rosti with eggs.